Electric trolleys no longer click-clack past the front door, nor do stagnant spittoons rest beneath the bar’s front rail, but for over a century customers have been frequenting the establishment known, since 1933, as Pompilio’s. This bar and restaurant combination at the southwest corner of Sixth Street and Washington Avenue in Newport, Kentucky has hosted the full gamut of humankind: celebrities and the undiscovered, mobsters, bookies, and gamblers, (sports) players, birthday and funeral parties, slinky dancing girls and rotund cab-riding tourists from Cincinnati, the third shift on its way home in the morning and the late night lonely crowd headed wherever. The restaurants at this location have survived wars, Prohibition, raids, depressions, and a family of owners who simply ran out steam, the glitzy invasion of Hollywood movie makers, fires, and citywide utility breakdowns. There have been good times and bad, but six or seven days each week for years on end, Pompilios has been there for the hungry and the thirsty, the dating and dated. The history of our restaurant dates back to April 1, 1933, but the history of our building dates back to the turn of the last century, when the bar and adjacent dining room opened as small saloon. In 1902 the bar and adjacent dining room looked very similar to what we see today. With a furnished back and front bar and a $6,000 loan from George Wiedemann Brewing Co., Kettenacker’s saloon opened its doors for business in June 1902. The bar would change owners three times before the current restaurant opened in 1933. Pompilio’s Restaurant opened its doors for business on April 1, 1933, under the name of Pompilio House. It quickly became a tradition in Newport and all of Greater Cincinnati, open far into the early morning and re-opening a few hours later the same morning. Electric trolleys at the front door ran all the way from downtown Cincinnati to almost the southern boundary of cities bordering Newport, providing ease of access for anyone wanting to stop. 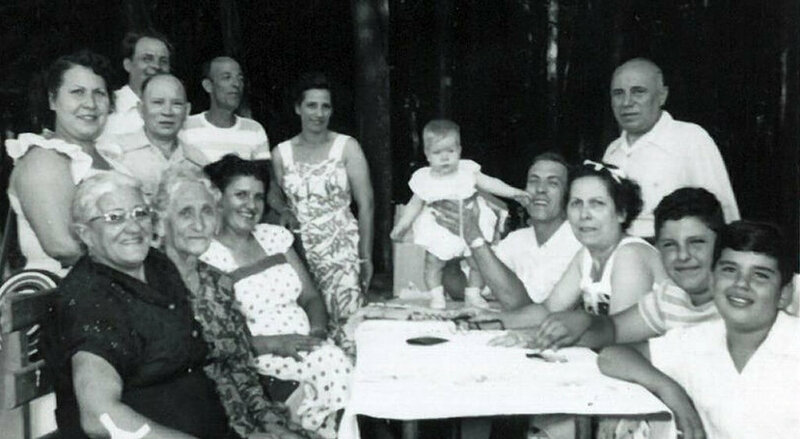 Breakfast was on the menu in the early years, and sixty-five cents bought Mrs. Pompilio’s homemade ravioli (still served today), a salad, bread, and a glass of beer or wine. By 1940 the Pompilios dropped “House” from the restaurant’s name, and it became Pompilio’s Café. It was around this time that the large dining room was built on to the southwest corner of the building. Large round mirrors that still hang today were lined the walls, and jukebox remote selectors that played 45-rpm records for a quarter were put at each booth. The 1940s were the grand days of infamy for Newport, and much of that action took place a few blocks west along Monmouth and York streets. Pompilio’s served as a temporary relief from nearby illicit activities. Even gangsters needed an occasional break. Stories are told about the famous thugs who frequented the restaurant wishing to eat like normal people — and you had better not be sitting at their favorite table upon their arrival. Legend has it that first one of the boys would kindly ask the unsuspecting Pompilio customer to move to another table. The second request, if required, was generally not as diplomatic in tone. The recessed booth, at the far rear of today’s old dining room, reportedly was one of the mob’s special spots. No one could easily sneak up on the table. Dancing girls, chorus girls, and famous celebrities like Frank Sinatra and Marilyn Monroe who were performing at local clubs or the famous Beverly Hills Supper Club, have all been rumored to have dined at Pompilio’s Café around this time. In May of 1982 the Pompilio era came to an end. A new Italian family, the Mazzeis, took ownership and renamed the business Pompilio’s Restaurant. Little change was needed. The name Pompilio’s was invaluable, as was all that intangible goodwill accumulated over the years. Thousand had dined, drunk, and become engaged there, and it was as if the place were a part of their families. The new owners continued to serve the same pastas and sauces that the Pompilios perfected, and they added some new dishes, like the Italian sausage, lasagna, cannelloni, and manicotti. In 1987, Hollywood came to Pompilio’s. The Greater Cincinnati Film Commission had arranged for the use of the restaurant for the filming of a short segment in the 1988 award winning movie Rain Man. It was right there in the old dining room, just off the bar, that Dustin Hoffman as Rain Man ordered pancakes. (“Today is Tuesday, I must have pancakes.”) As he got up from the table, he knocked over a box of toothpicks and immediately called out the number spilled on the floor. Hollywood came a second time to Pompilio’s for the 1993 skate board movie Airborne. The stars were not so well known at the time as Hoffman and Cruise, but two young actors, Jack Black and Seth Greene, later became big names in Hollywood. In the early ’90s, Pompilio’s went through another small renovation. The main dining room, dating from the early 1940s, was remodeled. The six-plays-for-a-quarter jukeboxes were removed. The high windows were revealed again, and new ones adding more natural light were cut into the west wall. In 2011, a second generation of the Mazzei family took over at Pompilio’s. A kitchen was added above the bar (so patrons can smell the fresh meatballs and ravioli being made during the day), a large selection of Kentucky’s finest bourbon was added to the shelves of the original back bar, and live music can be heard two to three nights a week inside and outside throughout the year.